Former Stormwater Program Manager, Jacob Fincher, has been appointed as Sweet Water’s Acting Director. Since 2015, Jake has managed the Respect Our Waters educational campaign, which informs and educates residents of southeastern Wisconsin about stormwater pollution prevention. By forming and fostering relationships with our 37 partner municipalities, writing grants and seeking out other funding opportunities, developing educational content, and engaging in public outreach, Jake has made this program an essential component of stormwater pollution prevention in southeastern Wisconsin. He is ready to bring his skills, experience, and knowledge of the many aspects of the Milwaukee River Basin to the role of Sweet Water’s Acting Director. Joan Giuliani and Alyssa Schmitt have been appointed as Co-Chairs of Sweet Water’s Board of Directors. Joan is the Environmental Engineer at MillerCoors, and has been a member of Sweet Water’s board since 2018. She played a major role in MillerCoors’ achievement of standards that conform with the requirements of the Alliance for Water Stewardship International Water Stewardship Standard, making them the first brewery in the world to do so. Alyssa Schmitt is a project engineer at Stormwater Solutions Engineering, LLC, and has been a member of Sweet Water’s board since 2016. Alyssa works on green infrastructure and storm sewer design in her role as an engineer and has seen the implementation of her work in communities around southeastern Wisconsin. We are excited to have such great leadership on our board and in our work here at Sweet Water! Thanks to Jake, Joan, and Alyssa for rising to the challenge of helping Sweet Water achieve our goal of restoring the Greater Milwaukee watersheds to conditions that are healthy for swimming and fishing! Sweet Water: What will the volunteer training event on May 4th consist of? Milwaukee Riverkeeper: All new monitors are required to attend a 6-hour training prior to the season beginning. Our training begins in the classroom discussing why we monitor different water quality parameters and why they are important to sustaining aquatic life. The second half of the training we head into the field, to put monitoring techniques into practice. SWWT: Do volunteers choose the sites that they monitor? MR: We post all of our available sites on a map that we embed into our website. This gives interested parties the ability to see what parts of the basin we are looking to monitor. Monitors sign up directly through this map, which can be found here. Returning volunteers have the option to continue monitoring the sites they have done historically or to pick new ones. SWWT: How many volunteer water quality monitors are there currently in the Milwaukee River Basin, and where are new volunteers most needed? 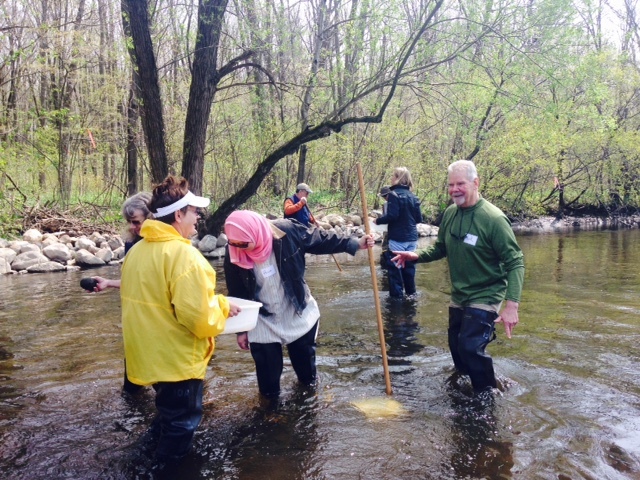 MR: In 2018, our Baseline Water Quality Monitoring program had over 80 volunteers monitoring over 100 sites throughout the Milwaukee River Basin! We are always looking for more monitors in the northern part of the Basin: the East and West Branch Milwaukee River Subwatershed and the North Branch Milwaukee River Subwatershed. Those parts of the Basin are in need of more monitors either from the area or willing to drive to conduct monitoring on a monthly basis. SWWT: Why are dissolved oxygen levels, temperature, turbidity, and other water quality parameters that volunteers test important to monitor? MR: Dissolved oxygen, or the amount of oxygen dissolved within a volume of water, is impacted by many things including water flow, water depth, water temperature, and plant photosynthesis. As the temperature within a stream rises, the amount of dissolved oxygen in the water decreases, in turn affecting many aquatic plants and animals that require oxygen to live much like terrestrial organisms do. The amount of dissolved oxygen fluctuates hourly and daily, and a measurement of dissolved oxygen is a snapshot in time of water quality. On the other hand, observing the aquatic life within the stream can be an indicator of long-term stream health. That is why our monitors perform a biotic index. The biotic index is a presence/absence survey of aquatic macroinvertebrates, aka aquatic bugs and mussels, found at their site. Some aquatic macroinvertebrates can tolerate low water quality, while others are more sensitive to pollution. Areas with a higher presence of sensitive species will have a higher biotic index score. Our program also monitors nutrients, specifically phosphorus. Phosphorus is an essential nutrient; however, in excess it can promote harmful algal blooms – which can have impacts on aquatic and human life. Water quality within our basin is important; our rivers, as well as all the precipitation that falls within our basin, eventually makes its way into Lake Michigan – where over a million people in our area get their drinking water. Baseline water quality such as oxygen and temperature can also determine which types of fish communities that a stream can support, and help identify management measures that might be needed to improve fisheries or water quality (e.g., more tree cover needed, better erosion control, more riffles, etc.). Water quality parameters such as bacteria can also provide information on whether water quality is safe for recreation, for those kayaking, swimming or fishing. Water quality also impacts the quality of life of the communities that our rivers run through, and affects our water-based tourism industry as well as adjacent businesses and homeowners. SWWT: Where is the data available once it has been collected, and how is it used? MR: All of the data collected by volunteer monitors, and other organizations throughout the Milwaukee River Basin, are put into the Wisconsin Department of Natural Resource’s Surface Water Integrated Monitoring System (SWIMS). This data is used to help identify problems affecting the river as well as to identify impaired waters for listing or delisting. Our phosphorus and chloride data, in particular, has led to these listings and a handful of delistings over the last ten years. Once a waterway is listed as impaired, new or increased discharges of pollution are not allowed per the Clean Water Act and a Total Maximum Daily Load (TMDL) is required, which is a plan for ratcheting down pollution and restoring the waterway. The Milwaukee River Basin has a TMDL for phosphorus, total suspended solids (e.g., sediment), and bacteria. Data is also used by WDNR, our municipalities, and community groups to help make more informed management and policy decisions. The mussel and macroinvertebrate data in particular is bringing new information to the WDNR for many streams that have not been historically assessed. SWWT: Is attending and completing the training a commitment to be a Water Quality Monitor? MR: Training is required, and we use monitoring protocols and equipment required by WDNR. We also request monitors register to monitor a site prior to attending the training. We do this to ensure we will have enough monitoring equipment and/or monitoring locations, as both of these are limited. If you would like to chat more about the commitment before registering, feel free to reach out to me, I can be reached at katie@milwaukeeriverkeeper.org. If you do attend the training and feel like this program is not the right fit for you, we will miss you but understand! SWWT: If I can’t commit to be a water quality volunteer, are there other volunteer programs of Milwaukee Riverkeeper that I can take part in? MR: Baseline Water Quality Monitoring is a summer long commitment to monitor your site at least once a month. If you are unable to commit to this level of monitoring, do not worry! Milwaukee Riverkeeper has many different volunteer opportunities! Within the Water Quality program, we also have opportunities to participate in mussel surveys, emerging contaminant sampling events and, if you are looking to get outside during the winter, road salt monitoring. Milwaukee Riverkeeper also will be hosting its 24th Annual Spring Cleanup on April 27th, for anyone interested in participating, and we also host an Adopt-A-River Program for those looking to make a longer term commitment to a section of river! 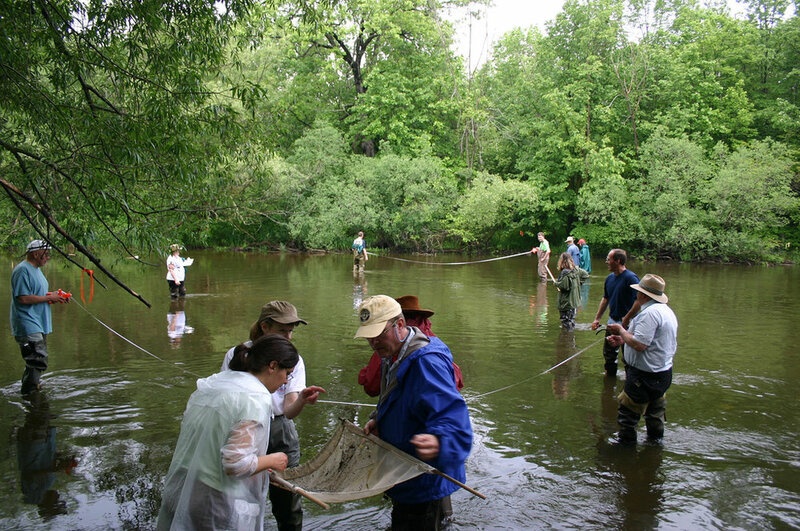 For more information about the water quality monitoring program, and to sign up, visit https://www.milwaukeeriverkeeper.org/protect/water-quality-monitor-signup/. Also, check out Milwaukee Riverkeeper’s 2017 Milwaukee River Basin Report Card to learn more about the state of the river and to read testimonies of other volunteer monitors!